For today’s reading the angels took me right to the Angels of Abundance Oracles Cards by Doreen & Grant Virtue, 1 card pull. 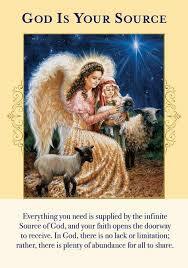 And the card is: GOD IS YOUR SOURCE. The message on the card is: “Everything you need is supplied by the infinite Source of God, and your faith opens the doorway to receive. In God, there is no lack or limitation; rather, there is plenty of abundance for all to share. This card comes as a reminder from the angels to please ask. We can’t deliver without you taking the asking step, they say. Even when we want to lift you up, to bring you your desires, to let you see your true abundance, we cannot unless you ask us, specifically, to do so. So please ask!, dear ones, they say. Stop being so shy! Stop holding back. We are waiting and waiting and waiting. Please ask for all things you desire, large, small, minute, medium, enormous — it really doesn’t matter. We are here for you for all of them. And you must ask us, to activate that energy. So stop wasting time, stop waiting around, and start asking in whatever way feels best to you, they say. Pray, chant, say affirmations and mantras, write us a letter, send us a smoke signal, do ritual, spread cornmeal to the 4 directions — anyway you do your asking, anyway that calls to you, any way you’ll remember to actually use, to actually ask us through, is the right way now for you, they say. Please, dear ones, they say, open to receive, open to your abundance, open to the all that is, and the all that you can call in with your asking. You are so loved, they say, and we are so pleased to be speaking with you about this oh so important topic today, dear ones, they say. We love you, and we are so grateful for you. I really hope you’ll join us! The first LIVE Online class was a BLAST!